Excellent, I’ll take 2 please.. :) Nice job. Nice project. Could have been even cooler if he had rotated the screen 90 degrees to get a more authentic arcade setup. A couple of speakers mounted in the front part of the cabinet would be a good improvement. eeePC sound is too bad. The narrow vertical viewing angle on netbook screens means you really wouldn’t want this. Each eye would see substantially different images. It’s really annoying. If you wanted a portrait display, you’d need to use a different display. I want this. Oh the envy. 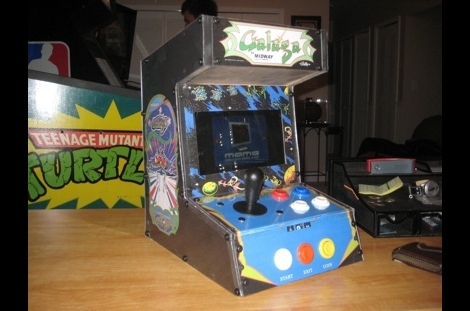 love these mini arcade cabinets, cant get enough of em. the only thing i’d do differently on the software side of things is replace the boot screen and launch mame as the shell on startup. lookin awesome, keep em coming. extra points for the turtles pinball machine in the background. Could you provide a link to the art so we can print it up?